Well, this is interesting! Back at Mobile World Congress, LG stated that the LG Optimus Pad (known in the USA as the T-Mobile G-Slate) would not have a glasses-free 3D display, and instead it would require a separately sold pair of 3D glasses to properly watch 3D content on the tablet. For the record, this pair of glasses will be the famed Red and Blue variant you are all so familiar with. Well, it seems that T-Mobile has put up a page on the G-Slate, and is doing us a favor by including a free pair of 3D glasses to watch 3D content on the display with! ← T-Mobile G2X Dropping April 15th? Maybe. I would think it will be $749, seeing that they added the 3D glasses. I wonder if they are going to come out with a Wifi version only? The 3D glasses I saw was pretty cool. Does this mean we can use this with ATT ipad dataplan ?? I wanna buy outright and see if I can use it on $15 or $25 ipad dataplans. tmobile dataplan for tablets is too damn expensive. But G2X specs doesn’t even list 1700 3G… which is strange. Don’t those kind of glasses come free inside a box of cereal?? Similar Technology to said box. I’m sorry but I don’t see how this thing will succeed at that price. It’s the 3G/4G Xoom all over again. 3D is cool and all but there are some really nice and affordable honeycomb tablets coming out very soon. 3D is not what is driving the cost up. I’m guessing 3D was added at a relatively low cost to create a perceived higher value since the other costs in manufacturing this device are likely really high. Tegra 2 only began sampling last summer. The relatively short time to mass production has probably made costs much higher than expected. Plus the high quality displays are a large part of the costs, as well as the certification testing that companies have to pay the FCC to do to sell it in the USA. take glasses and 3d back and reduce price $200. You will have a winner. Yeah, really. I don’t get the 3D craze. Then again, I also don’t get why you’d have a back camera on a tablet. Front facing makes sense for video chat, but who’s going to hold up a tablet to a photo or shoot video? 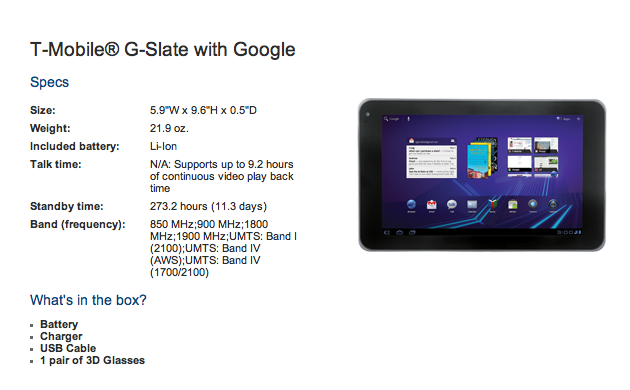 Despite all of that, I’d love to get the G-Slate but not at $750. That’s ridiculous. Back cameras are amazing on tablets, given the panaromic picture taking options which is amazing on the galaxy tab at least. One of the best features. The 3D would make some sense if it was either no glasses 3D or not the old fashion red and blue. I would love to get a 3D tablet and be able to watch some 3D movies on it, or if Netflix ever offers 3D movies then this would be up there with the most popular tablets. But red and blue doesn’t make any sense.That’s old technology there throwing on to something that could be a great tablet. Think about how discounts and MIRs work with phones now, then reread that quote. The G-Slate will be available as a prepaid mobile internet device on the website too, so don’t worry about that. Free 3D glasses?!?! Where do I sign up?! Just wanna get a tablet and nothing seems to we worth except this one. 629 no contract is OK for me. 729 little pain. 829 I m pissed but still getting. Whats up with these dataplans. $49 for 5GB. I got unlimited $20 preferred android on both my family lines and I lost on what to do with data plans. since you have t-mobile you will get it for 39.99. Just watched a PhoneDog video demo of this device that was done 2 weeks ago and the demostrator stated that the off contract price would be $749. I guess I’ll wait for the HTC Flyer and hope it gets upgraded to Honeycomb. Assuming we get 20% discount due to voice plan. 750+60=810 assuming you use it as wifi or use your phone as hotspot. I have 2 android phones with 2 $20 unlimited android preferred plans. Cant figure out which way to go. I am a Tmobile customer and frankly I got tired of waiting. I went out and got a Motorola Xoom Wifi and I love it! I have a Qwest internet account and I can access the AT&T Wireless network when I travel so I don’t need another data plan. I have had it about a week and no complaints! I’m not going to even consider buying an Android tablet for another 2 years, because there’s currently barely any honeycomb apps, and currently only one tablet has honeycomb. Plus, I’m very happy with caring around my Evo, and then I use my ultra powerful laptop while I’m at home.